What is a Commercial furnace? Gas furnaces when powered on, the thermostat sends signal to the system to generate heat. Consequently a valve opens which allows natural gas to reach a series of burners. These burners are lighted with a pilot light. These generate heat which enters the heat exchanger. The heat exchanger transfers the heat to the surrounding air which reaches your room through the ducts. When the desired temperature has reached the heating mechanism stops. It starts again when temperature drops. Gas furnaces usually run with natural gas or propane. In an electric furnace, when a thermostat sends a signal that heat is needed, the electrical ignition activates the heating elements. There is a heating coil, which gets extremely hot, when electric current passes through it. The coil heats the temperature of the surrounding air. This air is blow into your room through a blower. An oil burner or oil furnace is a heating device which burns oil like petrol, diesel or other similar fuels. The fuel is turned in to a fine spray by forcing it through a nozzle under extreme pressure. This spray is usually ignited by an electric spark. The burning of the fuel creates heat which is used to heat the surrounding air as in other furnaces. What are the types of commercial furnaces? These are the most basic model for gas furnaces. It hasa valve that opensand closes as directed by the thermostat. Once it opens gas flows into the burner at single rate that is high. The annual fuel efficiency rate(AFUE) is 80 to 90%. These furnaces will get the jobdone but are not very energyefficient. Moreover they are quite noisy. They are okay for homes in moderately cold regions but will not serve well in extreme temperatures. These furnaces also have the same design as single storage furnaces. The notable difference is that in these units you can control the valve’s flow of gas into two rates-low and high, or "half power" and "full power." They work in tandem with thermostat to understand the heating needs in the rooms. When you power on an 80,000 British thermal unit (Btu) two stage system at half power, it will begin delivering 40,000 Btus. This is quite okay in mild weather. Inchilly winter months the thermostat will send a signal for generating more heat. The valve will open fully in such asituationanddeliver gas at ahigh rate to create moreheat. There are some advantages of two storage furnaces. They are more energy efficient. Their AFUE rate is 80 to 95%. Moreover when you run the furnace athalf power, theheating cycle will be longer. It will result in better distribution of heat. The two stage furnaces heats up the room speedily and drops to economical flow. Some of the models of these furnaces donot need electricity to power the blower motor. They have a sophisticated, programmable thermostat connected to a variable-speed motor. These furnaces create less noise compared to their one-stage counterparts. These furnaces are integrated with a modulating gas valve that has a variable-speed blower. The system adjusts between 35% and 100% of total capacity. It regulates the burning of fuel according to thermostat stetting. The temperature will be within a ½ degree of your thermostat’s set point. When you power on the furnace, gas flows at high rate with fans not running at full capacity. Gradually the valve opening reduces regulating the flow of gas and the blower speed increases until maximum efficiency is reached. The fan then runs continuously. These units are highly fuel-efficient. Modern gas furnaces are being built with innovative features to increase their efficiency and makethem more and more energy saving. Most furnaces in the past had a pilot light which would ignite the gas. The demerit of pilot lights is that they continue to burn the gas even when heat is not needed. The have been replaced by electronic spark ignition. These fire the furnace only on demand. An advancement in gas furnaces has been the condensing furnace. Most furnaces have one heat exchanger, where the generated heat is transferred to the surrounding air. The exhaust gas is vented out of the system. The condensing furnaces have two heat exchangers. They run the exhaust gas again through a second exchanger to extract the available heat to use it in heating the rooms. They send out a cool exhaust and leaving behind condensed water. These produce 5 to 6 gallons of water per day. This is drained out with a condensate pump. Todaycompanies are buildingfurnaces that combine host of features to make them more and more suitable in commercialspaces. Some furnaces have adjustable speeds to match with the heating requirements. They extractmaximum heat with a secondary heat exchanger made of stainless steel. They have flexible thermostats for optimal efficiency. Some gas furnaces have microprocessor control board to control the output and blower speed for optimum efficiency. How to buy a commercial gas furnace? Buying a gas furnace for commercialspacesneeds lot of considerations. A professional help is required to determine the right size of the furnace. There are many factors to consider like amount of space, number of large or small rooms, theirorientations etc. Southfacingrooms are more likely to get heated by sunlight in the winter months. The type of weather in you region isalso adeciding factor. The quality of insulation in the building is also taken into account. A building made of brick isnaturally more insulated than other typesof constructions. High efficiency furnaces are better for offices,restaurants, shops, club houses, nursing homes, and hospitals. These have high buying and installation cost. Butthey give better output and also save more energy. Usually an area of 2,000 square feet would need approximately 50,000 to 60,000 Btu to heat it properly. This will give you a good idea about the size of gas furnace you might need. Today you get software which can accurately determine the size of the furnace you will need. 50, 000 Btu units can cost $5000 to $8000. Of course for commercialspaces you will need more BTUs. What is a geothermal HVAC? A geothermal HVAC system taps the power of earth to cool or heat houses. No matter where you are located, thesesystems can harness this renewable andsustainable fuel source. These devices have been around since 1940s. The best thing about this system is that they can use the constant temperature of the underground. 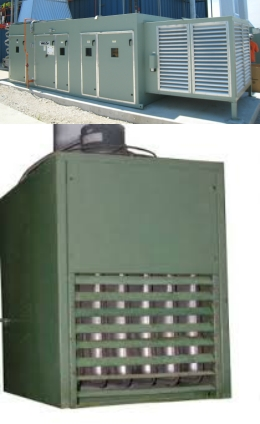 This renders the system an efficiency of 300% to 600% on the chilly winter nights vis-a-vis 175% to 250% of an air-source HVAC system on cool days.Although the temperature above the ground fluctuates from sub-zero to scorching high with seasonal changes, the temperature under the ground remains constant. As in a cave, temperature under the ground is warmer than the surface air in winter and cooler than the air in the summer. The Geothermal HVAC taps this wonderful source of and gives it out through anexchanger. Installing heat pump is quite a hefty capital investment. But it is worth as the costwill be offset by energy savings in 5 to 10 years. These are highly durable system lasting for almost 25 to 50 years. TheHVAC can be broadly divided into two categories- Closed loop and Open loop. In the closed loop a tube containing non-freezingliquid is placed in deep wells. The liquid in the tube absorbs the heat from underground and gives it outto the refrigerant in the HVAC system through a heat exchanger. This heat id circulatedto heat up the house. 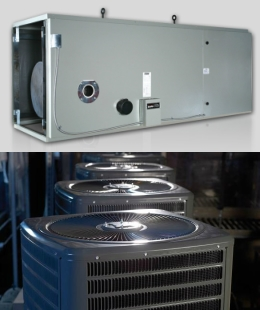 Another variant of aclosed loop heat pump is the direct system. This does not need a heat exchanger. It pumps the refrigerant through copper tubing that is buried in the ground. These systems need large compressors. They work best in moist soils. So you will need additional irrigation to keep the soil moist. Also you should see that the copper tubes are not beingcorroded by soil. 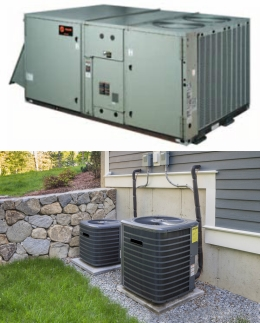 In closed loop system there are three types of geothermal HVACs. They are horizontal vertical and pond /lake system. In open loop system, the water is taken from the ground or surface water (pond, lake, etc. ), circulated to the individual heat pumps. Here the heat is drawn from the sourcethrough an exchanger. The water is thereafter returned to the ground via a disposal well or to the lake or pond. Horizontal HVACs are quite cost effective. They are suitable for residential use. They are mostly installed for new constructionswherethere is sufficient land to place one. They usually have a pair ofpipes one buried at six feet, and the other at four feet. In some cases both can stand adjacent to each other at five feet in the ground in a two-foot wide trench.